Now look. It was very impressive. I enjoyed it immensely. Along with everybody else (the poor bedraggled hundred or so republican protesters excepted). But this isn’t North Korea. So I hope it’s not verboten for the London Walks guide who “broods over words” to demur ever so slightly. Except they didn’t. They certainly had some very impressive, wonderfully special, utterly memorable occasions. The word pageant in this sense doesn’t pitch up in the English language until 1805. In its much older sense – “a play in a mediaeval mystery cycle (or an act or a scene in such a play)” – the word debuts right at the beginning of the 15th century. But pageant in the sense that the media mob have been endlessly hammering it into our heads – “a brilliant or stately spectacle arranged for effect; esp. a procession or parade with elaborate spectacular display” – well, that sense of the word is barely 200 years old. 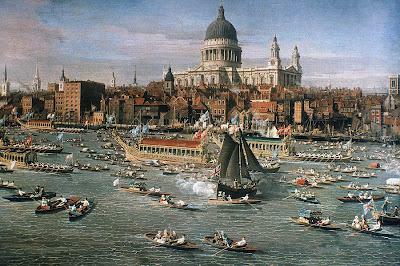 And of course that morsel of word savvy also sharpens, ever so slightly, one’s view of the other benchmark that’s been endlessly bruited this weekend: Canaletto’s famous painting of the Thames and St. Paul’s on Lord Mayor’s Day. The painting is dated 1746. It was a river procession. A ceremony. A magnificent scene. Like Sunday’s. But it wasn’t a pageant. Right about the time Canaletto was painting that scene, the great Dr. Johnson held forth on matters bibulous: “Claret is the liquor for boys; port for men; but he who aspires to be a hero must drink brandy”. Well, London Walkers are heroes. So you’ll be equal to this. “Pageant” is claret. This is a dram of brandy. A dram of brandy that adjusts the balance ever so slightly. Can’t help but adjust it because it’s strong stuff indeed. It’s a couple of stanzas from a “painting” of the river and its town that is almost contemporary with the emergence of the word “pageant” in its modern sense. It’s the opening of Canto X of Byron’s Don Juan. Goes like this (the vantage point is Shooter’s Hill). The sun went down, the smoke rose up, as from A half-unquenched volcano, o’er a space Which well beseemed the “devil’s drawing room,” As some have qualified that wondrous place. But Juan felt, though not approaching home, As one who, though he were not of the race, Revered the soil, of those true sons the mother, Who butchered half the earth and bullied t’other. A mighty mass of brick and smoke and shipping, Dirty and dusky, but as wide as eye Could reach, with here and there a sail just skipping In sight, then lost amidst the forestry Of masts, a wilderness of steeples peeping On tiptoe through their sea coal canopy, A huge, dun cupola, like a fooscap crown On a fool’s head – and there is London town! Now that’s what I call “an elaborate spectacular display”! 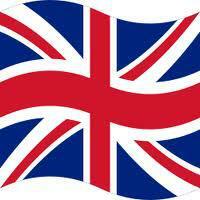 London town. It’s a broad church. Even got room for a London Walks guide who won’t be bullied into a verbal anachronism.